Proteas in the Blaaaaaaauwwwww Kiln! That was a snapshot of my studio shelf earlier this morning. Those pieces are all now in a bisque firing in our new Blaauw kiln. I have been working with a new flower theme lately– plants from the Proteaceae instead of orchids. I am in love with the detail and the visual texture of crowded intertwining lines. It’s incredibly tedious to draw these flowers, but the reward is great. I have been glazing work of this style with a transparent magnesium based glaze with almost no visible crazing. I hope they don’t crack in the kiln. These are also new forms for me. I have been doing more hand building that throwing lately, but I’m still not great at making strong smooth seams when I attach things. 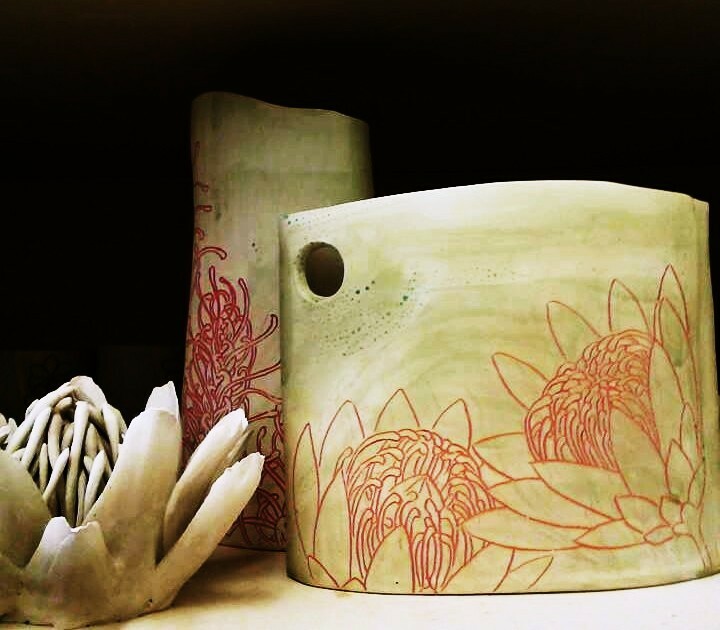 I’m hoping to be able to load up a glaze firing in the Blaauw early next week, seeming as how I have an art show coming up, plus the sale, plus I need to just get new things fired already. It’s about time. I’m leery about firing to cone 10 in the Blaauw since last time it was programmed to fire in cone 10 reduction it actually went to cone 13 or 14 and it was a disaster for the grads who had to clean up the shelves from all of the pots that ended up glued to them by their own glaze. The glaze just ran off the pots. Some shelves were unsalvageable. I don’t want to be the next person to blame. I will be the first one in the studio to give it a go for a cone 10 oxidation firing. I am sick and tired of trying to get oxidation in gas kiln #5. It gets so uneven every time that I feel the need to give it the slightest amount of reduction to even out, which turns into way more than I plan on. Last time almost everything went purple, except for the work on the very bottom shelves, which behaved and went blue. I’m hoping that the Blaauw will give me the evenness, temperature, and atmosphere that I want. I put so much time into my work that it would be a shame to see it all go purple/liver pink– again. This entry was posted in Art, Ceramics, Design, Drawing, Nature, Painting, Print Making, Science, Sculpture, Uncategorized and tagged ceramic art, grevillea flower, hand built ceramics, kira call, porcelain, protea flower, proteaceae, proteas. Bookmark the permalink. 1 Response to Proteas in the Blaaaaaaauwwwww Kiln! My favourite flower – your work is just beautiful!